Huge 'Hidden Worlds' Murals Brighten Fullerton Underpass At Lake Shore Dr.
"A Kaleidoscope of Hidden Worlds" moves from the microscopic to the macroscopic. 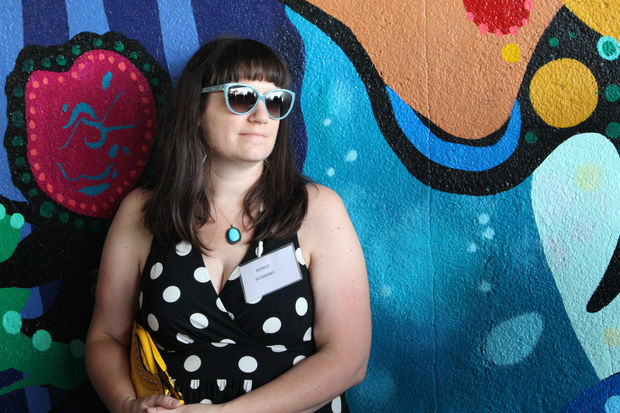 LINCOLN PARK — Renee Robbins' mural "A Kaleidoscope of Hidden Worlds" goes from the microscopic to the macroscopic, and in the process it covers two of the largest "canvases" in the city. 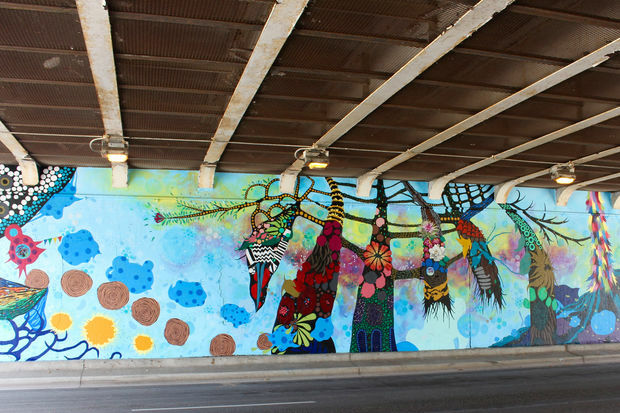 Lincoln Park residents and city officials formally celebrated completion of Robbins' mural project on both sides of the Fullerton Parkway underpass at Lake Shore Drive on Tuesday. Steve Weaver, executive director of the Chicago Public Art Group, which served as general contractor on the privately funded project, applauded its "big vision" at Tuesday's ceremony, as it covers both sides of the underpass, each 14 feet high by 110 feet wide. "The design moves from the microscopic to the macroscopic on both sides," Robbins said following the ceremony. "I think of it as a blend of the real and the imagined." Renee Robbins stands in front of her mural "A Kaleidoscope of Hidden Worlds" at Tuesday's ceremony. The south wall mixes forms and images from humans, nature and the cosmos, while Robbins said she thinks of the north wall as "a parade underwater in Lake Michigan." Ald. Michele Smith (43rd) and Commissioner Mark Kelly, head of the Department of Cultural Affairs and Special Events, both cheered how it was paid for by private individuals and local groups under the Fullerton Mural L3C umbrella group, led by Paula Kahn and Marsha and Philip Dowd. "This is a really big deal, to pull off the private funding of a public wall," Kelly said. Kelly cited how it was part of Mayor Rahm Emanuel's declared Year of Public Art in 2017, as well as the city's overarching Public Art Plan. "We see the city as a huge landscape," he said. "It becomes who we are in Chicago." "I know how important art is to our community," Smith added, calling the mural "a glorious gift." It was inspired by similar murals at Lake Shore Drive underpasses farther north at Foster and Bryn Mawr avenues. Robbins said the entire project took about five months of full-time work, with nine weeks spent on the design and seven weeks on the actual painting on site, as she was helped by seven assistants. Robbins specializes in art drawn from the natural world, and she now moves on to prepare for a solo show at the nearby Notebaert Nature Museum set to open in June.